Commercial-scale biodiesel producers have many constraints beyond those which small producers need to meet. Commercial producers must satisfy the expectations of owners and/or stockholders for profitability. They must make optimal use of capital and other resources. They also have to include the cost of labor because it comes from paid employees. Small-scale producers will often ignore the cost of their time and the value of the space they devote to producing fuel. Commercial-scale producers must also meet regulatory requirements for safety and environmental standards which are monitored by government agencies such as EPA and OSHA. This means that all process chemicals must be accounted for and waste must be minimized. Commercial producers must incorporate recovery of excess chemicals and recycling into their plant designs. 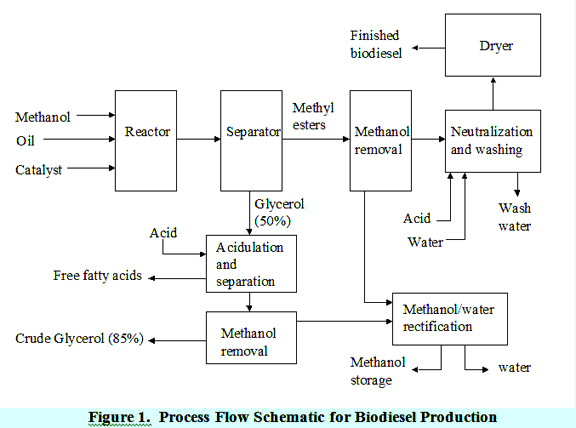 Figure 1 shows a schematic diagram of the processes involved in commercial-scale biodiesel production. Alcohol, catalyst and oil are combined in a reactor and agitated for approximately an hour at 60ºC. Smaller plants often use batch reactors, but most larger plants (> 4 million liters/year) use continuous flow processes involving continuous stirred-tank reactors (CSTR) or plug flow reactors. The reaction is sometimes done in two steps. In this system, approximately 80 percent of the alcohol and catalyst is added to the oil in a first-stage CSTR. Then the reacted stream from this reactor goes through a glycerol removal step before entering a second CSTR. The remaining 20 percent of the alcohol and catalyst is added in this reactor. This system provides a very complete reaction with the potential of using less alcohol than single-step systems. Following the reaction, the glycerol is removed from the methyl esters. Due to the low solubility of glycerol in the esters, this separation generally occurs quickly and may be accomplished with either a settling tank or a centrifuge. The excess methanol tends to act as a solubilizer and can slow the separation. However, this excess methanol is usually not removed from the reaction stream until after the glycerol and methyl esters are separated, because the transesterification reaction is reversible and the methyl esters may recombine with glycerin to form monoglycerides. The glycerol stream leaving the separator is only about 50 percent glycerol. It contains some of the excess methanol and most of the catalyst and soap. In this form, the glycerol has little value and disposal may be difficult. The methanol content requires the glycerol to be treated as hazardous waste. The first step in refining the glycerol is usually to add acid to split the soaps into free fatty acids and salts. The free fatty acids are not soluble in the glycerol and will rise to the top, where they can be removed and recycled. The salts remain with the glycerol, although depending on the chemical compounds present, some may precipitate out. One frequently touted option is to use potassium hydroxide as the reaction catalyst and phosphoric acid for neutralization, so that the salt formed is potassium phosphate, which can be used for fertilizer. After acidulation and separation of the free fatty acids, the methanol in the glycerol is removed by a vacuum flash process, or another type of evaporator. At this point, the glycerol should have a purity of approximately 85 percnet and this is typically sold to a glycerol refiner. The glycerol refining process takes the purity up to 99.5 percent to 99.7 percent, using vacuum distillation or ion exchange processes. After separation from the glycerol, the methyl esters pass through a methanol stripper, usually a vacuum flash process or a falling film evaporator, before entering a neutralization step and water washing. Acid is added to the biodiesel to neutralize any residual catalyst and to split any soap that may have formed during the reaction. Soaps will react with the acid to form water-soluble salts and free fatty acids. The salts will be removed during the water washing step and the free fatty acids will stay in the biodiesel. The methanol that is removed from the methyl ester and glycerol streams will tend to collect any water that may have entered the process. This water should be removed in a distillation column before the methanol is returned to the process. This step is more difficult if an alcohol such as ethanol or isopropanol is used that forms an azeotrope with water. Then, a molecular sieve is used to remove the water. A water washing step is intended to remove any remaining catalyst, soap, salts, methanol or free glycerol from the biodiesel. Neutralization before washing reduces the water required and minimizes the potential for emulsions to form when the wash water is added to the biodiesel. Following the wash process, any remaining water is removed from the biodiesel by a vacuum flash process. In recent years, so-called waterless wash processes have been developed that minimize the need for waste water treatment and disposal. Special processes are required if the oil or fat contains significant amounts of free fatty acids (FFAs). Used cooking oils typically contain 2 percent to 7 percent FFAs, and animal fats contain from 5 percent to 30 percent FFAs. When an alkali catalyst is added to these feedstocks, the free fatty acid reacts with the catalyst to form soap and water, as shown in the reaction below. With up to about 5 percent FFAs, the reaction can still be catalyzed with an alkali catalyst, but additional catalyst must be added to compensate for the catalyst lost to soap. The soap that is created during the reaction is washed out after the reaction with the water wash. When the FFA level is above 5 percent, the soap inhibits separation of the methyl esters and glycerol and contributes to emulsion formation during the water wash. In these cases, an acid catalyst such as sulfuric acid can be used to esterify the free fatty acids to methyl esters as shown in the following reaction. This process can be used as a pretreatment to convert the FFAs in high FFA feedstocks to methyl esters, and thereby reduce the FFA level. Then, the low FFA pretreated oil can be transesterified with an alkali catalyst to convert the triglycerides to methyl esters. As shown in the reaction, water is formed, and if it accumulates it can stop the reaction well before completion.